‘WhataHoot’ – A local business to ‘hoot’ about! Brancaster Bay Shellfish is a family run, 6th generation fishing business based in Brancaster Staithe on the North Norfolk Coast. 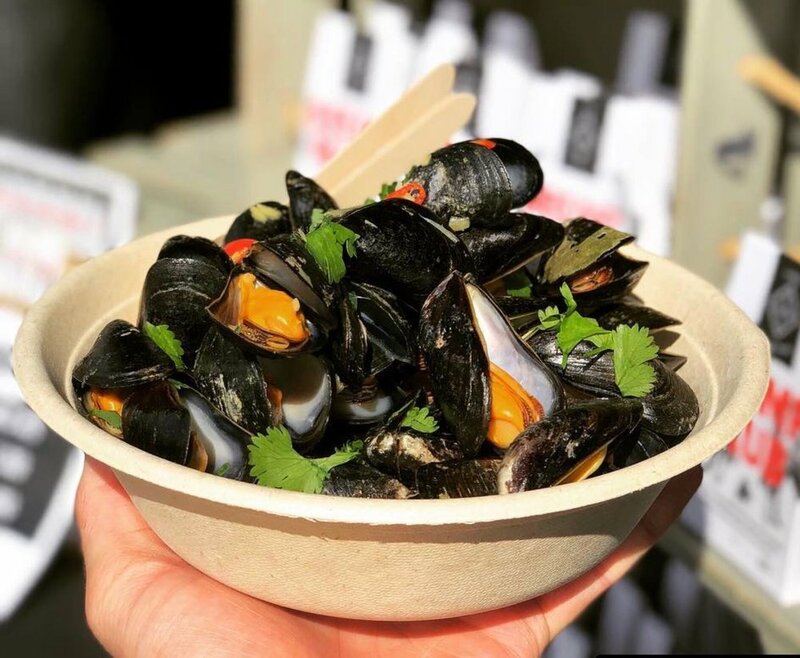 In 2015, they came up with the genius idea of The Mussel Pod, a touring ‘pod’ bringing the best Brancaster Mussels on offer to festivals, events and pubs – including the Norfolk Enterprise Festival 2018. The Mussel Pod was inspired by generations of mussel fishermen who have personally grown and nurtured Brancaster Bay Mussels since the 19th Century. We caught up with Sarah Knight, Operations Manager at Brancaster Bay Shellfish, to tell us more about The Mussel Pod, and their thoughts on attending the Norfolk Enterprise Festival. When did you have the idea for the Mussel Pod? We attended a small monthly food festival in a suburb of a large city during the summer of 2015 and thought it’s all the same…pizza, burgers, Thai food etc, there’s no variety so we thought well why wouldn’t a mussel unit work? Thomas is a mussel farmer and has been supplying pubs, restaurants and markets for years so he knows the market in the area very, very well. Luckily we had the funds ourselves and took a gamble. Can you describe the Mussel Pod? A purpose built bespoke unit which we tow around the UK attending food festivals and events. We hope to educate members of the general public whom may not have had the fortune to try gorgeous and well cooked fresh mussels direct from the farmer himself. Did you enjoy being part of the Norfolk Enterprise Festival 2018, and did you make any valuable connections? Very much so, when we were offered it we thought what a fantastic idea. A bringing together of local business and people with business ideas at one event – brilliant! We discovered we could apply for a grant to enhance and grow our business. We also met the owners of Chet Valley and spoke with them about using their wine in our recipes. We are now investing in their business through leasing some of their vines. How do you think the NEF could help local businesses grow in Norfolk? To grow in business you sometimes need to take a chance and have faith in your product. To clarify something you may be struggling with you need someone’s different outlook on things and that’s where attending talks and meeting people such as those whom attended the NEF would come into its own. What advice would you give to anybody wanting to start a business in Norfolk? Do your homework! Lots of research on supply and demand if it’s seasonal. Source locally wherever possible whilst also remembering sustainability and your carbon footprint. Be prepared for lots of hard work and some knock backs but don’t give up! The Norfolk Enterprise Festival confirmed our thoughts and beliefs that The Mussel Pod is a great idea. Everyone who ate with us, loved the whole idea and ethos behind our story, and of course it’s great to put a smile on someone’s face who is eating not only your product but one that you have also prepared and cooked.